This principle has a great repute and a very fair appearance; but it is profoundly evil and presumptuous. It supposes that the truth is at our disposal. Philippians iii. teaches quite a different principle: there is no idea of concession nor of any arrangement in expressing the truth so as to reconcile different views. It is said, "Let us therefore, as many as be perfect, be thus minded." It is not, Let us lower down the truth to the measure of him who has not come up to it. Nor is it two persons ignoring which of the two has the truth, or content to suppose the possibility of error in giving up more or less what they hold, in order to express themselves so as to be agreed. All this is an infringement upon the authority of the truth on us. "And if in anything ye be otherwise minded, God shall reveal even this unto you." There is no question here of concessions, but of the revelation from God to enlighten him who is not perfect in the truth. "Nevertheless, whereto we have already attained, let us walk by the same rule, let us mind the same thing." There is no question here of concessions, but of walking together in the things we possess, with regard to which, because recognised as being the truth of God, there is no giving up anything, all being subject to it. In that case, there is no concession, either on one side or on the other; for all possess the same truth, having already attained to it in a measure, and they walk, together minding the same thing. The remedy for the diversity of mind which may remain is not to make concessions (how deal thus with the truth? ), but the revelation from God in favour of him who is ignorant, as we are all of us on diverse points. But I shall be told, On that footing one will never come to an agreement. Where will you find in the word such a thing as coming to an agreement? To come to an agreement is not the unity of the church of God. The truth is not to be modified, and we are not called to force our imperfect views on anyone. I must have faith, and one must have the same faith, to walk together; but in the things received as the truth of God by faith, I can make no concessions; I may bear with ignorance, but I canot arrange the truth to please another. You will tell me, In that case how walk together? But why lay down grounds of unity which require either unity of views, or so evil a thing as concession on such or such a truth? As to the things on which we possess the truth and with regard to which we have faith, we have the same mind, we walk in them together. If I acquire some knowledge more, I bear with the ignorance of my brother, until God reveals the thing to him. Our unity is in Christ Himself. If unity depends on concessions, it is only a sect founded on human opinions, because the principle of the absolute authority of the truth is lost. They will tell me, that true Christians will never yield on fundamental points. I was going to say "I understand;" but it is not so. There are many who are agreed in spite of the errors which affect the foundations; I know that others would not; but this does not prevent the fact, that the principle of concessions is in no wise authorised in the word, denies the authority of the truth on us, and pretends to be able to dispose of it for the sake of peace. * The word supposes the bearing with ignorance, but never concessions, because it does not suppose that men could make a rule different from itself, in order to come to an agreement. I receive a man "weak in the faith;" but I do not yield anything to him as the truth, even on such a point as herbs; I might perhaps deny essential truths by so doing. Such a case may happen, where to observe days might lead to doubt of the Christianity of him who does it (see Gal. iv. 9-11). There might be another case where I could only say, On this very point, "let every man be fully persuaded" (Rom. xiv. 5,6,&c). Sometimes the whole of Christianity depends upon something which can be borne with in other points of view (Gal. ii. 14), I repeat, there is no trace in the word of a system which suppresses a part of the truth so as to have a common confession, but the contrary. There was the perfect truth, and God revealed what was wanting, when it was otherwise. They were of one mind and they walked together, and there was no need of concessions. One did not pretend to such things as required them; that is, the Bible does not suppose what one has the pretension to do. It is to mutilate the truth that it may be adopted by many. The word, therefore, and especially Philippians iii., condemns this arrangement of mutilated truths, with a view to get them to be adopted by everyone; for this is to dish on our God and His truth. These are means for forming a sect, composed of those who are agreed on the points laid down as grounds of union. It is never the unity of the church of God; it will be an orthodox sect, even if it should take in a greater part of a nation, because it is a body formed on the agreement to which men have come on certain truths; but it is not the unity of the church of God. In a confession of faith there is no question of bearing with individuals who are ignorant on certain points, nor of acknowledging together that one is lacking as to the knowledge thereof, nor of enlightening those who are so: they just declare the truth they possess, that others may, by agreeing with that declaration, join themselves to such as have adopted it as a ground of union. That all may adopt it, the profession of the truth must be reduced to the measure of ignorance of all those who come in, if they are sincere in that profession; but this is not bearing with others: it is persons, as I have said, who dispose of the truth of God by a human compromise. 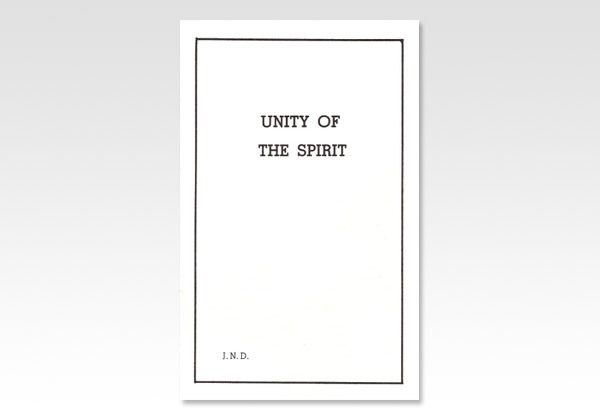 Is that the unity of the Spirit? And, again, pay attention to this. If I know the truth and make a concession so as to unite myself others in a common profession, my concession is just simply yielding the truth to him who will not have it. If I, with others, make concessions because we only have opinions and are ignorant of the truth, or have no certainty as to it, what a monstrous pretension to lay down, in that state of ignorance, a rule to be imposed on others as a ground of the unity of the church, under penalty of not forming part of it! I may be told, But instead of this you impose your views, as being sure of the truth. Not at all, because I believe in a unity which already exists, the unity of the body of Christ, of which every Christian forms part; whereas you establish union on views on which you have come to an agreement. You will tell me that I am indifferent then as to the truth! No; but you have used improper means to guard it, by imposing the profession of a part of the truth as a basis of unity. * Here is the thing better expressed than I could do it myself "There is something which is more compromised among us than the truth; it is its value and its claims. We are less far from finding the same dogmas in the scriptures, than from giving them the same authority over us; and we may be allowed to affirm that the questions on which Christians are divided would soon be settled. if they drew near to the Bible with the intention of taking seriously all the truths it proclaims. Alas! while we read, the devil murmurs in our ears, All that is not equally pressing, equally obligatory; we are commanded to bear with the weak; Paul made himself all things to all, even consenting to offer sacrifice and to circumcise Timothy; on the other hand, edification goes be/ore dogma; the principal dogma itself goes before the secondary dogmas, &c. One involuntarily opens the ear to a language which appears plausible and prudent; which appears not to attack a single truth, but which is only the more calculated to render them all powerless. From afar one bows before each truth; but if it comes near to us, if it requires us to act - to sacrifice anything, at once the present truth is ranked among the truths that are out of season." - Archives, Sept. 22nd, 1949.